I had so much fun putting together my modern fall baby shower, I wanted to share a shopping guide with a few of my favorite fall decor items! I kept it pretty simple in regards to decor. The flowers, pumpkins and items below made the event special and easy for me to put together being 33 weeks pregnant! Hopefully you’re inspired by some of this charming decor! Fairy Tale Pumpkins – I bought these at my local grocery store! Gold Triangle Garland – The super chic and simple garland is from Harlow & Grey and I’m obsessed with how it easily transforms a space. Instant party! Copper Moscow Mule Mugs – I searched high and low for good quality Moscow Mule mugs that didn’t cost a fortune! I even thought about renting them, but then found these, which I was SUPER happy with! The quality is great and now I get to keep them for future parties! Punch Bowl – The Britta Optic from Crate and Barrel is one of my favorite modern punch bowls! Gold Stripe Straws – I will never get over paper straws! 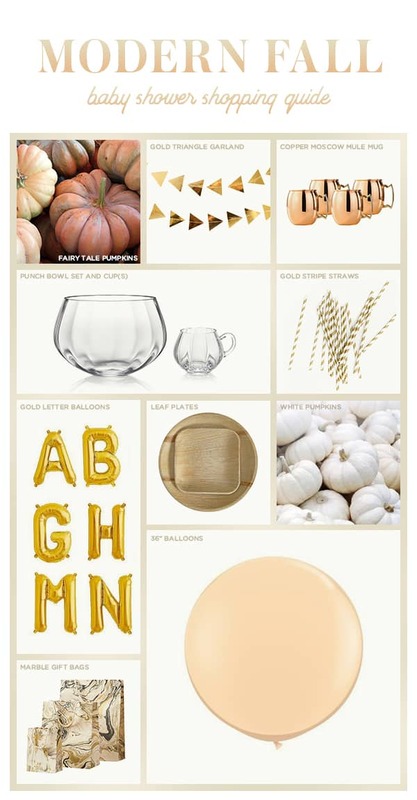 Gold Letter Balloons – These balloons are mini so you can spell out whatever you want and add a festive touch! Disposable Leaf Plates – We used disposable plates to make clean-up easier at the shower. The quality of these plates are so good, everyone kept asking me if they were even disposable!! Mini White Pumpkins – Bought these at my local grocery store and we used them for our craft activity and to place around! Marble Gift Bags – All of our guests were able to fill a gift bag to take home. I saw these modern ones from Paper Source and fell in love! Giant Balloons – I love using giant balloons for parties since they’re easy and super festive! Instead of trying to fit them in my car already blown up, I bought these and then used a helium tank like this to inflate them at the location!